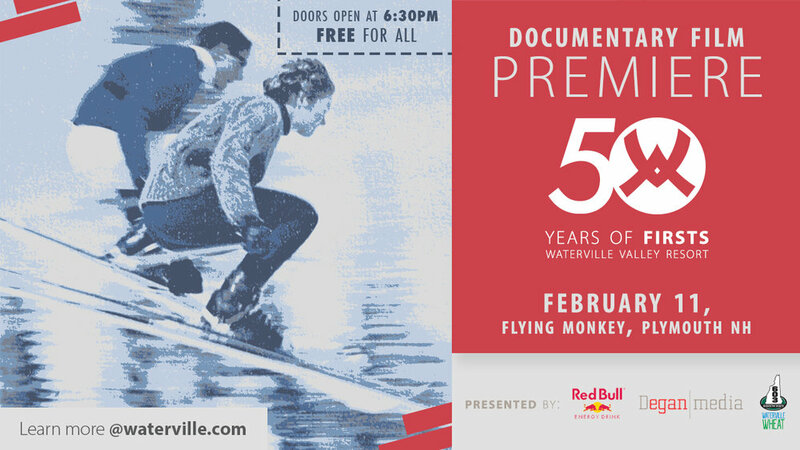 Join us at the Flying Monkey located on South Main St. in Plymouth, NH as we premiere "50 Years of Firsts, Waterville Valley Resort", a documentary film about Waterville Valley Resort by Degan Media. This event is FREE to the public. Doors open at 6:30pm, presentation starts at 7:30pm. For the 50th Anniversary Movie Premiere Waterville Valley Resort will open an exhibition where guests may browse archive pictures and memorabilia, learn about the Resort’s history and future, and take a picture with friends in an interactive selfie station. Commemorative 50th Anniversary Books will be presented by author and graphic designer Will Zimicki, and will be available for purchase.